frank posted newtwitter performance analysis. frank liked The Chemical Brothers – Another World (Album Video). frank posted Firefox for Android Is Growing Up Fast. frank posted Promote JS – give newbies a chance. frank posted Microsoft Replacing Windows Live Spaces with WordPress.com. frank posted “The Social Network”: Mashable’s Complete Movie Review. frank published Ik ben 15 jaar. frank Frank hoort four tet nu zelfs al op klara … *like*.. This entry was posted in web wandering on 29 September 2010 by frank. We were surprised when our website got deleted, but we’re even more pleasantly surprised to be back. “When our website got deleted”, seriously Stijn? A Facebook-page isn’t a website and it isn’t yours either, ultimately. When on Facebook you are (and I am) at the mercy of a private company that has absolute power over anything you do on its premises. Facebook decides what pages look like, Facebook decides what you can and cannot post and Facebook reserves the right to expel you from their community for whatever reason they do or don’t come up with. Given the increasing importance of social networks in our lives and economy (and the never-ending privacy-problems with Facebook), I do believe that we’d be better of with a open, decentralized system which does not have a sole (commercial) owner with absolute power. That’s why it’s a good thing that Diaspora exists, even if the alpha code they released a couple of days ago is not up to expectations. That’s why status.net (and identi.ca) are great. And that’s why OStatus, an open standard for following friends and sharing statuses on distributed social networks which is already implemented in status.net and which will probably go into Diaspora as well, is incredibly important. 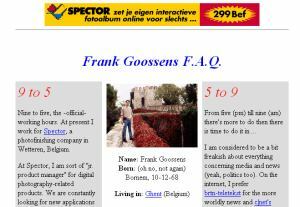 This entry was posted in Internet, lang:en, rants & raves and tagged diaspora, facebook, ostatus, privacy, status.net, stubru on 21 September 2010 by frank. RSS is dead and Facebook and Twitter killed it! Or at least that’s what some web & trend-watching bloggers conclude from the demise of Bloglines, the once cutting-edge web-based feedreader. And indeed, people are increasingly discovering news items and memes through their friends’ status updates, re-tweeting or -sharing stuff they deem interesting. And yes Flipboard, which scans your Facebook & Twitter feeds for links (scraping content from the pages instead of using feeds, to the dismay of some publishers), is the talk of the iTown. Look ma, no RSS! But hold your horses; do you know what the most requested feature for Flipboard is? Integration with Google Reader and the ability to include RSS-feeds is in high demand as well! And while we’re at it, Google Reader seems not to be doing too bad either, according to their own stats, probably because Reader -as opposed to Bloglines- continuous to evolve, integrating a slew of social features. Reader is also the primary source for Feedly, a popular browser add-on that offers a magazine-like view on subscribed feeds. And proving RSS is not dead yet, Automattic last week launched Subscriptions on wordpress.com, which displays your subscribed feeds in a stream-like fashion, including the writer’s profile picture and a ‘reblog’ and ‘like’ button (i.e. resembling what Peter Van Dijck proposed earlier that day). Even if RSS-readers would ever become marginalized, RSS and similar standardized XML-based newsfeeds (think Atom) are indispensable to syndicate content from one site in another application. After all, how do you think news outlets and blogs feed their content into Twitter and Facebook in the first place? This entry was posted in Internet, lang:en, rants & raves and tagged atom, bloglines, facebook, google reader, rss, twitter on 16 September 2010 by frank. Het is weer september, de mooiste maand ter wereld en ik had er dit jaar bijna niets over geschreven, tot ik op de radio William Shatner en Ben Folds met “It Hasn’t Happened Yet” hoorde. Dat nummer is zo ontstellend mooi-melancholisch dat ik alweer een paar dagen werkombekwaam ben (maar niet echt, collega’s, niet echt). Luister maar eens naar dit tubeken en lees ondertussen de tekst of kijk gewoon een beetje dromerig naar buiten, naar de zomer die bijna niet meer is. 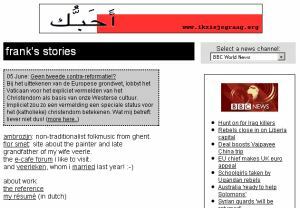 This entry was posted in Futtta-land, lang:nl, Muziek, ourTube and tagged ben folds, de mooiste maand ter wereld, kcrw, melancholie, william shatner on 13 September 2010 by frank.